Now Hiring Class A CDL drivers in the Arvada, CO area! Paid Training & Orientation! SIGN ON BONUS for experienced drivers! Now Hiring Class A CDL drivers in the Parshall, ND area! Melton has been running strong for 60 years & has a built reputation for quality & excellence in the transportation industry! Now Hiring Class A CDL drivers in the Greenville, NC area! Melton Truck Lines is at the top of industry pay & benefits! Now Hiring Class A CDL drivers in the Lizella, GA area! Melton Truck Lines is at the top of industry pay & benefits! Now Hiring Class A CDL drivers in the Franklin, KY area! Melton Truck Lines is at the top of industry pay & benefits! Now Hiring Class A CDL drivers in the Palmetto, GA area! Melton Truck Lines is at the top of industry pay & benefits! Now Hiring Class A CDL drivers in the Oregon area! Melton has been running strong for 60 years & has a built reputation for quality & excellence in the transportation industry! Now Hiring Class A CDL drivers in the Ranger, GA area! Now Hiring Class A CDL drivers in the Rye, CO area! Performance & Driver referral bonuses! Melton Truck Lines is at the top of industry pay & benefits! Now Hiring Class A CDL drivers in the Conley, GA area! 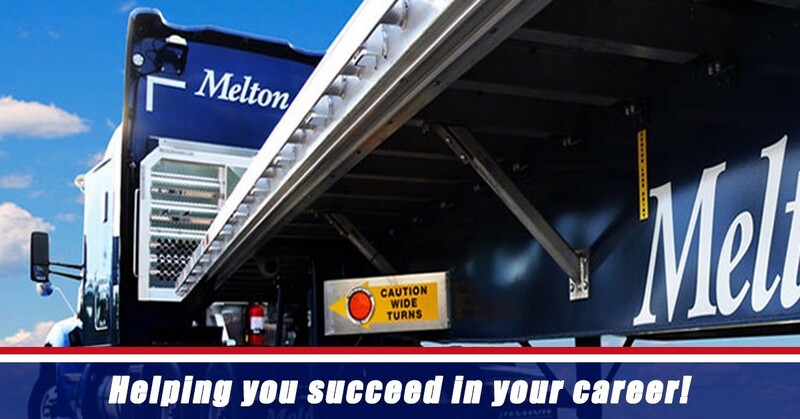 Stability & Security: Recognized as an award-winning flatbed carrier since 1954, Melton Truck Lines is at the top of industry pay and benefits. Melton has been running strong for 60 years and has a built reputation for quality and excellence in the transportation industry. Let our recruiting department help you begin the process of becoming a part of the Melton team Call 877-976-6765!